We feature the following lines of furniture because we like the quality of the products, as well as their versatility. Having a good place to sew can greatly enhance the experience. Sewing or cutting at the proper height can reduce strain and fatigue. Tracey's Tables is a local Wisconsin company that produces high quality, yet affordable sewing furniture. Tracey's products have been very popular. 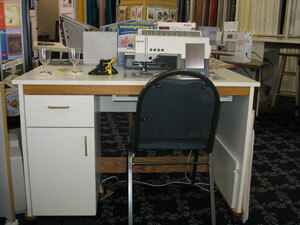 The product line includes sewing cabinets, cutting tables, serger and embroidery carts, hutches and wardrobes. 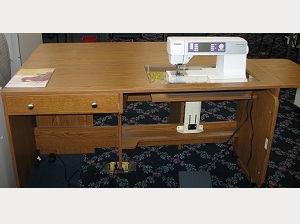 Horn of America has a variety of sewing cabinets for sewing machines, embroidery machines and sergers. Storage caddies, cutting tables, chairs and even a nice line of scissors are available.